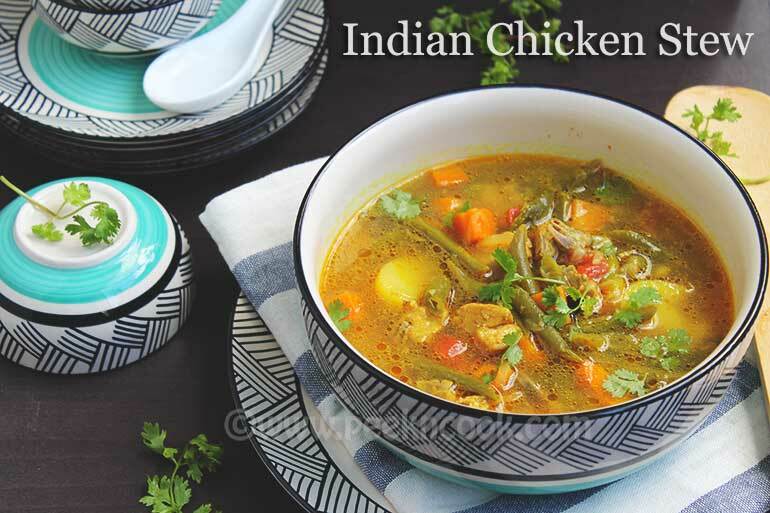 Indian style chicken stew is a very healthy one pot meal, cooked in 1 tablespoon oil, lots of veggies & bite size chicken pieces. Take the chicken pieces , wash and pat dry. Put the chicken in a bowl, marinate with some salt & turmeric and keep aside. Now take a pressure cooker, heat 1 tablespoon oil, add tejpata, cinnamon, cardamom, cloves fry for 2/3 seconds, add chopped garlic. Now add chopped onion & vegetables. Lightly fry them and add chicken to the cooker. Fry everything for 5 seconds. Now add chopped tomato, ginger, coriander & salt and stir everything. Add 3 cups water, some salt into the cooker. Close the cooker and cook upto 3 whistles. Turn off the heat, let the pressure release itself. When the pressure will be realesed open the cooker and again put the cooker on the heat. Let boil the stew for 10 minutes. Check the salt & turn off the heat and serve with Hard Toast Bread. If you like this recipe, please go to my Facebook Page & hit the like button to get regular updates.